You can now switch to full screen presentation mode right from the file preview. If the file has multiple pages, use the up and down icons (or the up and down keys on your keyboard) to navigate to the next page or slide in the file. It's perfect for presenting PowerPoint, and other files that have multiple pages. You get more out of integrating with HipChat when you've got a team to collaborate with. To make it easy to build a team, we've given administrators the power to invite existing Confluence and JIRA users directly from the HipChat integration screen. 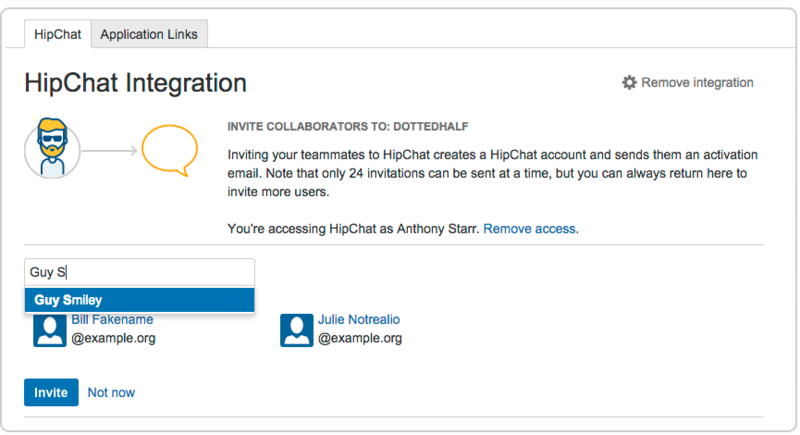 Select users and an email will be sent informing them that a HipChat account has been created for them. Once they confirm the account, they can access HipChat and get working. For more information, you can refer to the Tempo release information.